January 20, 2011 /Photography News/ Answer the question "Where Was Wix?" 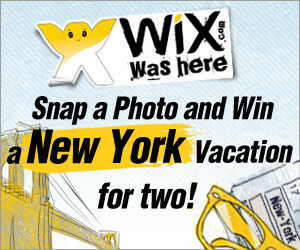 with an original photo taken in any location that embodies a visible "Wix Was Here" badge, for a chance to win a 3-day trip to New York City for two. If the Winner is from the Tri-State Area (NY-NJ-CT), he/she can choose between Tel Aviv, Israel and San Francisco, California as an alternative destination. Eligibility: The competition is open to US and international users who are at least 18 years of age. Download/Create the ‘Wix Was Here’ badge. Snap a photo of the badge anywhere. Go to the official Wix.com fan page. Click ‘Like’. Click the ‘Contests’ tab on the fan page to submit your photo. The winner will be selected by a tally of "votes" on February 22, 2011. The entrant who owns the photo with the most "votes" will receive the Grand Prize. Licence: By entering the contest, all entrants grant an irrevocable, perpetual, worldwide non-exclusive license to authorized parties, to reproduce, distribute, display and create derivative works of the entries (along with a name credit) in connection with the contest and promotion of the contest, in any media now or hereafter known, including, but not limited to: display at a potential exhibition of winners; publication of a book featuring select entries in the contest; publication on www.wix.com or via any other media. For more information, visit http://www.wixwashere.com/.